You are currently browsing articles tagged Sedona. This is Eagle Feather. Who says my eyes scare him. Photo by David Lansing. That sounded interesting. I asked him if the angels could do Spanish tarot cards and showed him my pack. He said Spanish tarot cards were no problem. Eagle Feather didn’t waste any time. He flipped over the cards like a man on speed and told me that I am boyish in nature; that I need to stop expending all my energy trying to save other people; that I have no business sense; that a conflict that has been destroying my relationship with people I love is now resolved in my heart though I still have work to do; that an obsessive person who has been trying to control me is finally leaving my life; that I am no angel but still full of compassion and good intentions but, because of my boyish nature, I often get into trouble; that I live in a neighborhood that makes me uncomfortable because it forces me to try and act a certain way and I should move; that I am in perfect alignment with my male/female sides; and that it is time for me to focus on what my heart believes in and not let anyone talk me out of it. I thanked him, paid him double what we’d agreed on, and went back to my room at the Enchantment Resort were I proceeded to drink the better part of a bottle of tequila I’d brought with me. Spanish tarot cards. Photo by David Lansing. The vortex tour with John, the former Dairy Queen proprietor from Minnesota, ended up back at the Center for the New Age so I figured I might as well have a look around. This place is the Wal-Mart of New Age paraphernalia. If you wanted it, you could get sage bundles and sage wands, herbal incense, mystic minerals and healing stones like black coral (“Absorbs Negativity!”), or a copper table-top pyramid to be worn on your head when you weren’t near a vortex. There were lingam stones from the Ganges River in India, energy candles, animal essences in little brown bottles (eagle, bear, dragon fly, wolf, wild horse, spider—how do you suppose you bottle the essence of a wolf? 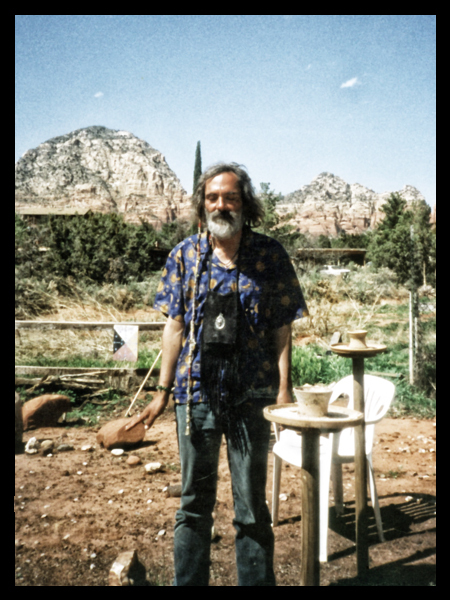 ), crystal balls, Celtic pendants, amber pyramids, nebula stones, satin spar selenite, Tibetan singing bowls (“Invoke a Hypnotic State!”), and a whole room full of nothing but crystals. There were Good Karma yo-yo’s and harmonic planet CD’s and aura photos. They also had a bookcase that was nothing but tarot cards—sacred path cards, medicine woman cards, mana cards (Hawaiian tarot), Irish fairy cards, African tarot, and authentic Egyptian tarot cards. 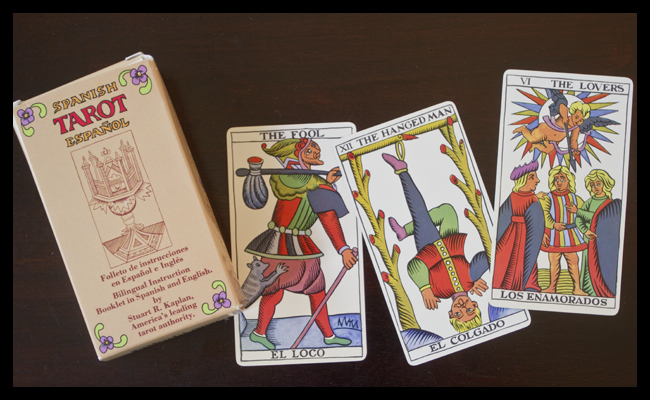 I ended up buying a Spanish tarot deck with El Loco (the Food), El Colgado (The Hanged Man), Los Enamorados (The Lovers), and the like. Now I just need to find someone to read them.